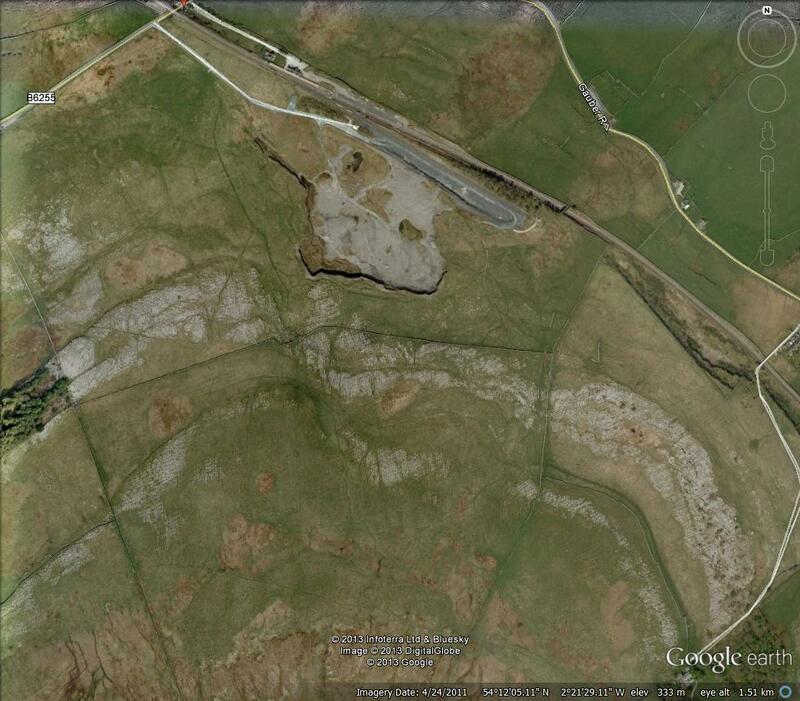 The Ribblehead quarry at Gauber, just west of the road junction, contains a very special historical feature: the remains of a farmstead that is believed, though not strictly proven, to have been inhabited by Vikings. The remains of a rectangular Longhouse and two other buildings are there to be explored, but you have to know exactly where to look ... and there are no signs pointing the way. This may have been Mrs Batty's final view - across Batty Moss to the bleak but fascinating Ribblehead moorland. This, during the ice age, was a major snow gathering plateau with glaciers spreading out from this central hub in different directions. Nearby is the abandoned Ribblehead quarry at Gauber which provided limestone for the iron industry in Durham, as well as for toothpastes, cosmetics and agriculture. It closed in 1958 and is gradually being reclaimed. The birdlife is superb and it is a botanist's paradise. The 'Three Peaks' seat is a bizarre but strangely enjoyable feature of the quarry, now in the hands of English Nature. Above the quarry, limestone is still in its natural state. Take the Big Mac, for example - or Pac Man! Tucked away over the wall to the south of the quarry is this wonderful archaeological site: the Gauber Viking settlement. This is the entrance to what was the Longhouse, with walls four feet thick. A close-up view of the Longhouse entrance. The structure most likely had wooden beams arranged across to form a roof, and was either thatched or turfed. This is where people ate - and had forty winks! The kitchen lies just to the west. It is quite well preserved and excavations have revealed the remains of an oven - seen in the centre. Animal bones were also discovered. The doorway to the kitchen can be made out at bottom left. Another view of the Longhouse - stretching from the south facing entrance at bottom left, to the north facing entrance at top right. Looking through the kitchen door. The buildings have been dated to the 9th century AD but there is still much debate about whether they were Viking or Saxon. From comparison to similar sites we can make the assumption that they are most likely Viking. Many place names in the area originate from Norse. The remains of the oven. The left hand stone contains a central hole. Possibly something was attached here. The kitchen, looking east across the Ribblesdale Drumlin Field. Entrance to the Longhouse showing the thickness of the walls in the construction. Another picture to give some idea of the width of the walls. It must have been a very substantial building. Looking south out through the kitchen door to the Longhouse. The mound on the right will have given some protection. The slopes of Park Fell rise beyond. Overview of the Gauber Viking settlement, looking east. The entrance to the Longhouse can be seen at right centre, just below the limestone pavement. The final building of the three is believed to have been a smithy. The remains of a hearth and tiny fragments of iron were discovered. The smithy still contains evidence of substantial stonework in the walls. It's a wonderful feeling to tread where steam and sparks flew all those years ago - in such a wild location. Almost joining the settlement is this burial cist - dating from the Bronze age or even earlier. The cist has a neat surrounding of stones. Did the Vikings or whoever built the camp choose this spot because of the presence of this feature - knowing it had been significant to earlier peoples? Nearby, the pavements and solitary trees are very dramatic. Whernside is topped by low clouds behind. The lonesome thorns in close-up. They make a fine subject for the camera. These pavements were scraped clean by the Chapel-le-Dale glacier some 12,000 years ago. Erosion has continued to cut deep grooves into the limestone. Some of the clints are very fragile and the edges snap off quite easily. Looking at the limestone, it's amazing to think this is the remains of tiny creatures that inhabited a warm, shallow sea when England lay near the equator some 340 million years ago! I wonder how many creatures made up that central boulder alone? Classic pavements such as this one, at Gauber, show the blocks or clints, the deep grykes in between, where joints have been enlarged by solution, and the wonderfully wavy karren grooving. Textbook geology on show here. Looking south east back across the karst landscape to the thorn trees we saw earlier. Beautiful Great Scar limestone. Some of the grykes here are over ten feet deep. Many rare plants flourish in these unique and protected habitats, well away from prying sheep. The glaciers, delightfully, left one or two boulders in very artistic poses. Note the arches of the Ribblehead viaduct, just to the north. This one is held up, on the right, by a tiny fragment of rock, slowly being weathered away. When it does go, the rock will tip to the right, and the increased slope will mean that the grooving on the surface will speed up. Come back in ten thousand years and it should look very differerent! From the the B6255 Ribblehead to Hawes road, top left, turn right up the rough track to the quarry, just before the bridge and the Station Inn. After a few yards go through the gate on the right and follow the obvious green track south east (clearly visible on the image) passing the south west 'bay' of the quarry until a gate is reached near an obvious 'chink' in the wall running west to east across the field. The settlement is situated immediately to the south of the first patch of limestone pavements through this gate, roughly in the centre of the image and slightly west of the central 'orange' patch. Return through the gate and head west onto the impressive pavements which continue to the wooded area at left. Here, the impressive limestone boulders such as the Big Mac will be unmissable. The isolated thorn bushes can be seen as an obvious dark spot on this pavement. Enjoy your adventure! A highly enjoyable blog! Thank you! My parents owned one of the railway cottages just to the east of what we always called "The Viking Site" and I got to help out with Alan King's first excavation here as a young teenager. It was the start of a bigger interest in the "Viking Age" (http://www.pbase.com/hajar/viking_art). I need to visit this place again.